Cheers as Santa lights the tree in Hastings Street with Andrew Phipps (Phippsy). 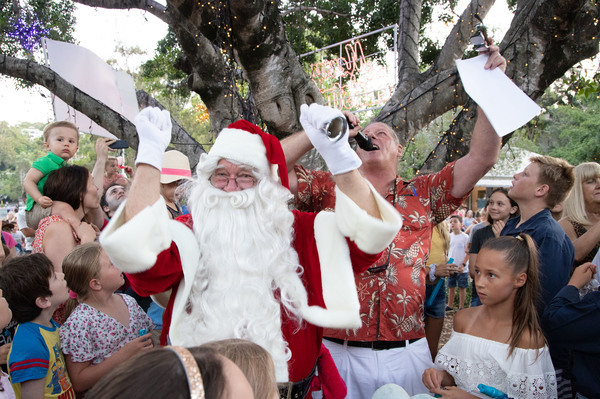 Hundreds of children were presented with early Christmas gifts on Friday from the Hastings Street Association as they announced the arrival of the festive season with assistance from Santa who dropped by to light the Christmas tree. “Come on Santa light the tree,” children shouted before the jolly man in red heard their calls and wandered in to Hastings Street with his team of elves an fairies. Santa called for cheers from the crowd to help him achieve the magical tree lighting. And everyone cheered as the lights shone.